Riding a mountain bike ca be quite dangerous especially without proper precautions. In mountain bike riding, necessary gear plays a very crucial part. A mountain bike glove is very different from regular gloves. It not only covers your hands but also protects your hands from getting numb due to the shock waves emitting from riding on a bumpy road. It is manufactured with different types of flexible, breathable and absorbent materials so that you can move your hands-free, and it keeps them from getting sweaty. The palms of the gloves are equipped with soft pads for good grip and in some cases, even the knuckles of the gloves are padded for extra protection. In the case of mountain bike gloves, a specific type of material has to be used. The material needs to absorb sweat and some additional material needs to be used to enhance gripping capabilities. In some gloves, the elastic material is added to make them more comfortable. Price range is a very important factor if you are going to buy any product. If you are interested in buying a glove that you are going to use only for a short period of time, then you probably won’t go for something very expensive. What you will look for is a cheap glove made of comfortable materials offering a good amount of safety and grip. A mountain bike glove has to be durable; otherwise, a single ride can make the gloves useless. These gloves not only cover your hands or provide you with good control over the bike; it continuously absorbs sweat from your palms and absorbs shock waves to protect your hands while riding. When you are looking for an exceptional mountain bike glove with additional padding, super grip, and extreme durability, Zookki Cycling’s Mountain Bike Gloves always comes first. 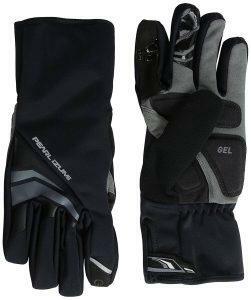 Theses gloves is specifically designed to provide extreme comfort during bike rides. The glove comes in multiple colors and costs only $9.99. The glove is made of a triple layer fabric which is a mesh of cloth and Lycra fabric. The material is flexible and breathable. It is also elastic in nature and has sweat absorbing capabilities. The palm of the glove is fitted with soft yet durable pads to absorb shock waves on bumpy roads. In some cases, the threading of the glove has created major difficulties for riders. 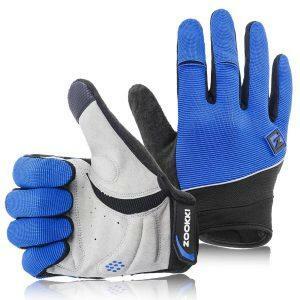 Overall, a good biking glove at an affordable price! This is the best overall mountain bike glove right now on the market. Highly recommended! 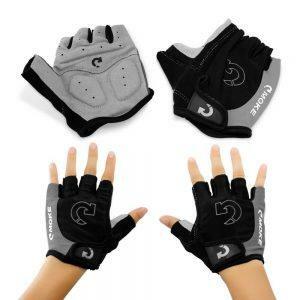 This is the cheapest but the most efficient bike riding glove in the market, available only at $13.59. Some of its unique advantages are mentioned below. The glove is made up of 62% Polyester, 34% Nylon and 4% Polyurethane. The glove is designed with micro-fibres and leather for durability and comfort. The newly available touch recognition formula is available with this glove so you can use your smartphones and tablets while wearing the glove. The silica gel pads on the palm work perfectly, it eases your palm’s fatigue and provides a firm grip. The thumb area of the glove is a bit too tight. To sum it up, you can go for these gloves with your eyes closed. As it is not only cheap but offers the best value for your money. In warm weather, wearing heavily padded gloves are not healthy and most importantly not comfortable as well. So, Adiew designed a bike glove, especially for the summer time. This is an amazing product. The fabric of the glove contains quality elastic materials, and it comes in different colours to choose from. 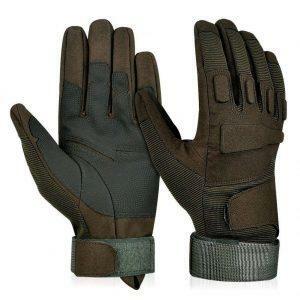 This glove can be used for a variety of purposes such as driving, bike riding, hunting, batting etc. The glove provides extreme support and compression. The silica gel padding system works really well, it provides a stronger grip. 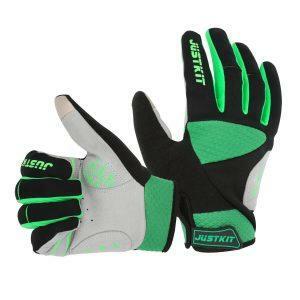 The glove is made up of triple layer fabric, it is breathable and the elasticity is great. This glove also comes with a money back guarantee. If you are not satisfied with the product you can get your money back. The glove is exceptional but the size of the glove is not universal. If you have big hands this glove won’t fit you. This is by far the most versatile hot weather mountain biking gloves in the market. Highly recommended!! Heavily padded and manufactured with thick fabric, Pearl Izumi’s full finger cycling gloves are designed especially for the winters and it comes with 2 different colors to choose from. This imported cycling glove is made of 60% Nylon and 40% Polyurethane. The synthetic leather on the palm is very soft and durable. The elite soft-shell of the glove provides superior water protection. There is conducting synthetic leather on the index finger and also on the thumb that helps to use smartphones while wearing the gloves. This glove is designed to keep your hands warm and dry always. The material of the glove is very durable. So, after prolonged use, you can expect that it will remain intact. The glove does not provide such comfort in all seasons. 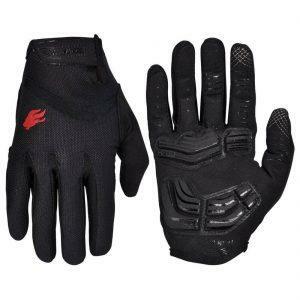 Overall, you can go for this if you want a durable and a versatile winter mountain bike glove. This is a very durable fingerless glove that comes in 3 different colours to choose from. The design is very attractive as well. This is a brand new and a very high-quality product. The top of the glove is made up of breathable material that regulates air flow and prevents sweating. The glove is specially designed to provide extreme comfort and support. The palm of the glove is fitted with separate friction pads for added support and grip. In low temperatures, this glove won’t be able to keep your hands warm. This is one of the most durable fingerless biking gloves out there on the market now. With many positive reviews backing up its capabilities, it is worth a try for sure. This is a full finger heavily padded mountain bike glove manufactured by FIRELION. It is an exceptional glove suitable for both men and women. This company has provided a size chart so that you won’t have to face any problems while ordering the glove. The bike glove is equipped with the convenient touch screen function to operate smartphones and tabs. The palm of the glove is fitted with synthetic leather to provide comfort and support. This glove is designed with suitable materials for enhanced efficiency in all seasons. Comes equipped with a breathable material, suitable for all seasons. The touchscreen feature of the glove can create difficulties for riders from time to time. Overall, if you are in the market looking for a fully covered full-finger biking glove, this should be your choice without any doubt. There are a lot of mountain bike gloves available in the market, so it is very hard to choose the best among them. The above guide consists of the best products in their individual categories. This will not only help you to choose the best available product but also help to choose the right one suitable for you. So choose accordingly!